Some of the most common symptoms of digestive dysfunction are: fatigue or lack of energy; stiff, sore joints; muscle spasms or cramping; headaches; heartburn; indigestion; gas pains and bloating; constipation and diarrhea; anxiety and irritability; depression; restlessness and insomnia. These are just the first signs of more severe problems to come, if digestion is not improved. Have you ever experienced any of these or know someone who has? I’d be willing to bet we all have at one time or another. These and numerous other problems can be avoided, prevented or reversed by improving digestion. If you do not make optimal use of your "pre-digestive stomach (See Part 1)," your pancreas must produce much higher quantities and concentrations of the enzymes necessary for completing digestion in your small intestine. Humans in modern, industrialized countries, have the largest pancreas, based on weight to body size, of any animal. All animals in the wild eat only raw food. Could our enlarged pancreas be the result of overwork, like muscles getting larger due to demands of heavier weights and increased activity? Which organ begins to lose function and, eventually, fail when there are chronic blood-sugar handling problems that frequently become the chronic degenerative disease known as diabetes? Correct. The pancreas. There are 250,000 to 300,000 edible plants worldwide. Farmers grow only about 150 to 200 different fruits and vegetables for markets. Of these, most of us choose to eat about the same 30 foods every four days. From these 30 food choices, most Americans consume only a couple of servings of fruits and/or vegetables daily. Organic vegetables and fruits have 20 to 40% higher anti-oxidant activity than conventional produce. Anti-oxidants protect your cells from the effects of aging. A better guideline than "a couple of servings daily" is to consume six to eleven servings of raw vegetables and fruits daily. More anti-oxidants equals less tissue damage and delayed aging. Your best option is growing your own organic produce. Next best is buying fresh, locally grown produce at a farmer’s market. Just be sure the fresh vegetables and fruits you purchase are in-season, organically grown and non-GMO. Since fruits contain higher concentrations of sugars, emphasize vegetables in your produce choices. An excellent way to easily consume eleven servings of vegetables is to begin your day with a vegetable smoothie. My recipe for two people is: 1 medium cucumber, peeled and deseeded; 2 medium stalks of celery; 2 handfuls of spinach; 1 handful of kale; 1 handful of chard; 1 handful of collard greens; 1 avocado; and 1 good squirt of fresh lime or lemon juice. For beginners, you might add a cored apple for the first couple of weeks. I use a Vitamix or, if just making it for one person, a NutriBullet. Blend thoroughly. Click here for more juicing suggestions. A salad for lunch and vegetables with dinner more than complete eleven servings of vegies a day. Sea vegetables (kelp) contain the greatest diversity and concentration of minerals. Minerals are essential to every function in your body. A large number of elderly people are deficient in one or more minerals, especially magnesium. There are numerous varieties of kelp. I like crumbling dried nori, wakame or hijiki and adding it to soups or salad dressings. I do not recommend fruit juice recipes because juicing just fruits concentrates their high sugar content and places an unacceptable stress on your pancreas. Even worse, however, are pasteurized commercial fruit juices. Without any naturally occurring food enzymes remaining after pasteurization, you may as well be eating pure sugar. One of the most nutritious foods is sprouts from seeds, nuts and grains. These are super easy to do on a regular basis. Add your sprouts to salads or as a garnish with your lightly steamed or sautéd vegetables. Click here for sprouting information. Your best organic protein choices include: eggs from uncaged, free range chickens; grass-fed and grass-finished beef; uncaged, free range chickens or turkeys; deep ocean fish; and wild game such as birds, deer and elk. I do not recommend consuming any meat proteins raw. I do, however, enjoy certified sushi-grade fish if I know and trust the restaurant and sushi chef. Starch choices should be organic complex carbohydrates: sweet potatoes, yams and related tubers; quinoa; lentils and legumes if prepared properly with pre-soaks and pressure cooking; squash; bananas, blueberries, pineapples, coconuts, melons and related whole fruits; millet, buckwheat and amaranth; oats; and rice. For years fats were incorrectly blamed for heart and cholesterol problems. In addition it was maligned as the culprit in weight gain. No longer. Briefly, good fats are essential for your brain and nerves as well as for hormone production. The best fats are from organically raised animals (especially clarified butter or ghee); avocados; coconuts; and olives. My favorite salad dressing, made at home, is: 1 T Bragg’s organic apple cider vinegar; 2 T Flora olive oil; a small to medium squirt of organic stone-ground mustard; fresh ground pepper; several shakes of earth or sea salt; and herbs and spices especially cayenne and turmeric. Equally important as making better food choices and preparation is drinking plenty of pure, unchlorinated, unfluoridated water. Click here for more information about pure water. When you look at the symptoms associated with lack of water, you’ll find several of the same ones attributed to poor digestion. Water is critical for enzyme function. Enzyme function is essential for life. Besides healthier food choices and preparation techniques to minimize the destruction of naturally occurring food enzymes, there is something else we are all often guilty of missing with our meals. Uninterrupted, calm, quiet, happy, social interactions with family and friends. This is essential for optimal digestion and is often a natural part of many long-lived cultures. In an interview with Vishin Lakhiani of MindValley, Anil Gupta explained an amazing technique for including everyone in meal-time discussions while increasing their confidence and communications skills. For example, he might simply ask his six year old son, "What have you done today that you have not been thanked for?" Then, he asks the same question of his daughter and his wife? His next question could be, "What are you grateful for today?" After everyone’s had a chance to respond, he asks, "What act of kindness did you see today? Then, "What act of kindness did you do today? And, finally, "What was great about today?" or "What magical thing did you see today?" At each evening meal a different family member leads the discussion with their own questions. What a marvelous concept. Parents and children forming a daily habit, from a very young age, of listening and communicating with each other. There are three more recommendations that could be extremely helpful for anyone. The first is one of the most successful dietary training programs in the world today. It was created by Eric Edmeades and is called WildFit90. You can find it by clicking here. The most common side effect reported with this program is weight loss. The second suggestion is a book by Dr. Steven Gundry entitled The Plant Paradox. This book and the WildFit90 program work quite well together. Click here for Dr. Gundry's book. The last tidbit is for anyone and everyone who cannot imagine ever changing their lifestyle enough to incorporate growing their own food, shopping at local farmer’s markets or modifying their cooking or eating habits. You should at least consider using supplemental digestive enzymes. The most effective are derived from plants or microbes. By far, the best enzyme formulas are created by Dr. Howard Loomis. Click here for Dr. Loomis' book. His Total Digestion formula will help you digest anything you eat. Take two capsules at the beginning of meals (just as you’re sitting to eat). Dr. Loomis’ enzymes work best at human body temperature and within a much wider range of pH. This allows them to work throughout your alkaline/acidic/alkaline/acidic digestive system. Your body will thank you. Enzyme potential decreases with age. Nutrient content of foods have declined with time. Even with a very high content of organic, raw foods in my diet, I use supplemental digestive enzymes with every meal. In summary, you can easily improve your energy levels, your memory, your mental sharpness, your moods, your sleep and your overall life. Select organically grown and raised foods. Eat as much of them raw as you can (remember veggie smoothies). Cook with as little heat as possible i.e. lightly steam, sauté or stir fry. Drink lots of pure water. Eat in a relaxed, friendly, sharing environment. Use supplemental enzymes to help with your digestion. P.S. 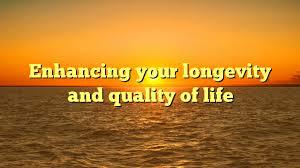 No discussion about improving quality or length of life is complete without mentioning exercise. Because it would be way too much for now, I’ll cover this at another time.